A stock photo of a Transcontainer terminal in Moscow. Credit: Ranglen/Shutterstock. TransContainer, Far East Land Bridge (FELB) and RZD Logistics have launched a new freight service from China to Hungary. The first 41-car service left Changsha, in the Hunan province of China, on May 27 and arrived in Budapest, Hungary, on June 15. It contained clothes, electronics and various equipment. The overall transit time on the 1,520mm gauge track across the territories of Mongolia, Russia, Ukraine and Slovakia was 13 days. Three days were spent crossing Mongolia, seven in Russia and three across Ukraine. 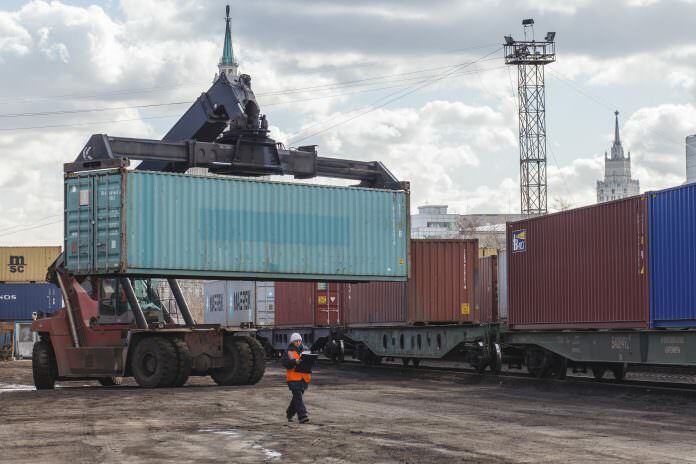 Customs clearance and transshipment to a narrow gauge was fulfilled at TransContainer’s Dobra terminal in Slovakia. TransContainer provided the rolling stock, equipment and terminal service for cargo processing; RZD Logistics forwarded the freight across Russia; and FELB – a subsidiary of RZD Group – operated the service. CEO of RZD Logistics Vyacheslav Valentik said: “Today the volume of transit from China to Europe is rapidly growing. These conditions require implementation of new services, which will allow to distribute these growing amounts between various border points while keeping the speed and price for the benefit of clients.